Mary Marvel has only recently received her amazing gift just like Billy Batson - by uttering the word "SHAZAM!" she is transformed into the world's mightiest woman. But being a newbie, arriving on the Watchtower, Mary is overwhelmed by meeting so many heroes and, well, just being in the hero gig in general. 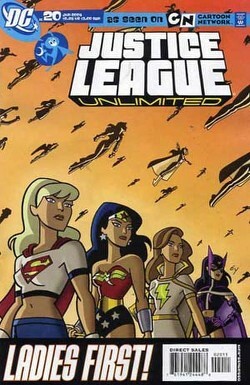 Supergirl jumps in and decides it would be good for Mary to watch the JLU in action on an actual all out mission. Strangely it's an all girl throwdown with some of he League's strongest, most powerful women - enough to take down any threat - right? Nothing EVER goes smoothly and when the mission starts going sour it's up to the League's newest and most inexperienced member to save the day. With even Wonder Woman taken down does Mary have what it takes to be part of the world's greatest team? -- that folks is all you're getting - a VERY basic summary. Well for once the JLU team have churned out something that is - BRILLIANT. The best thing I can say is BUY IT, it's what this comic should have been 20 issues ago! This is what I have been harping on about for months on end - Finally a decent book! Story - 5: FUN! Finally! Why is this guy not on the title permanently?? Art - 5: WOW it's Rick Burchett - since the days of DC animation comics this guy has shown us how it's done and done right. This is finally what I call a return to greatness! Cover Art - 5: It's TY again - I don't think I need to tell you more! I do? Well this cover is clever mimicking the designs from the JLU titles and the characters look so awesome (FOR ONCE!) It's got BUY ME factor ALL OVER IT!